I have the Amex Platinum and Chase Sapphire Preferred and was torn between the Amex Everyday Preferred and the Chase Freedom Unlimited. I was really looking for a card for non category purchases since both give you 1.5X (though you need 30 transactions a month on the Everyday Preferred for that). I finally decided settled on this card because of the grocery and gas rewards (4.5X and 3X) respectively. I find that I have no problem hitting the 30 transaction mark and I am now earning way more points because of the everyday spending category. I want to collect MR points and thought that this was a good card since I do not travel a lot (sometimes hardly at all). I specifically chose this card because of the category bonus (gas and supermarket). The only real issue I have is that sometimes, I have difficulty reaching the 30 transactions a month criteria to earn 50% more points. In fact it is quite irritating sometimes because I am constantly checking! So for some months, I earn 3X, 2X and 1X (supermarket, gas, all others) with no 50% bonus. On other months, I earn 4.5X, 3X, 1.5X respectively. I could kind of understand why Amex does this. They want this to be your goto card. But if I am missing too many months, I might downgrade to the regular Everyday card which has no annual fee. I fly business for my company and collect Membership Reward points. I was carrying and using the Premier Rewards Gold for a while. You get 3X for airline tickets and 2X on restaurants, gas and supermarkets. It is a nice blend between travel and everyday spending. However, since the Everyday Preferred came out, I have got and and now use it most of the time (to get to the 30 transactions a month threshold). Except for airline tickets and restaurants, everything now goes on the Everyday Preferred. With supermarket spending, you get 4.5X, 3X on gas and 1.5X on everything else. After 9 months, I exceed the $6k limit for supermarket spending and that is when I go on to use the Premier Rewards Gold. I end up paying $280 in annual fee but with the $100 airline credit on the PRG, it is really a net AF of $190, which I think is reasonable considering that I can earn a lot more points. My main card is the Amex Platinum and I use it because I travel a lot for work and the 5X that you earn from buying airline tickets a lot. You also get a lot of perks with this card that justifies the fee for me. However, you only earn 1X on everything else and there is no extra points earned for everyday spending. I got the Everyday Preferred to earn the everyday category points. 4.5X on supermarket, 3X on gas and 1.5X on everything else. I earn a lot points with this card and the annual fee is definitely worth it. The EDP is the perfect card for someone like me who wants to max out earnings on everyday spending. This is now my main card and so I have no problems reaching the 30 transactions per month requirement to earn the 50% more bonus points. The other peeve I have is that the sign up bonus is not great like other Amex cards. Also, there is a foreign transaction fee when you use it abroad. I used this card together with my Chase Sapphire Preferred. This card is used to supermarket shopping (4.5X if you meet 30 transactions a month), gas (3X) and non-category spending (1.5X). On the CSP, I use it for travel (2X) and dining out (2X). I feel that with these two cards, it allows me to maximize my points. Chase Sapphire Preferred also has the advantage of having no foreign transaction fees. That is why I mainly use Chase when I travel abroad. Because I have to split my spending between the two cards, I have to watch my transactions carefully and make sure I hit the 30 mark. Before I got this card, I tested the waters with the Amex Everyday (no annual fee version). I found out that I was hitting the 20 transactions a month pretty easily just from normal spending without doing any thing deliberate to increase the number of times I charge the card. In fact, on most months, I was hitting 30 or more. Then it dawned on me to consider the "preferred version". After running through the math, I found that the preferred version works out better for me. So I applied for it and was approved. I also got the bonus after meeting the spend requirements. I got an offer for a 30k bonus with $2k spend. I decided to take it and got approved. After using this card for over a year, I decided that this one is for keeps. After doing the math, it is clear that for me, I would earn more MR points. The way I meet the 30 transactions per month requirement is simply to use the card every morning for my cafe latte!! After having this card for over 8 months, I decided that this is the only AF card that I will keep. I will probably hit the grocery max at 11 months so that is not too bad. But I really like earning gas at 3X. The most understated benefit of this card is if you can earn 1.5X on non-category spending. This really adds up. Since I like using MR points for air travel, this card is the best among the among of other Amex MR cards to earn MR (for my spending pattern - yours may differ). I am still collecting MR points because I live near and Delta hub and to me, Skymiles are still valuable. I know miles are constantly being devalued. But though I considered between the EDP and BCP, miles still come out ahead for me rather than cash back. This will be the only card I will use to earn MR cos I think it is the best value (unless you are really flying all the time in which case, the Amex Platinum makes sense). I just got this card and am quite torn about the following situation. 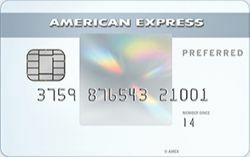 I also have the Amex PRG and with that you earn 3X on travel, 2X on dining and gas and supermarkets. But the annual fee is $195. The ECP covers gas and supermarkets (with $6000 cap) but the AF is $95 ($100 less). I do not spend like $10,000 on dining a year to justify that extra $100 and furthermore, with the EDP, I get 50% bonus which means 1.5X on non-category spending. If I keep two cards, I will be out of pocket $290 a year. I am kind of leaning towards canceling the PRG and just keeping the EDP. The second year stats were roughly the same but without the sign up bonus. So I earned 63,900 points on 25,800 in spending, which is more than 2X on average and covers the annual fee. I easily meet the 30 transactions per month requirements. The downside of this card is that restaurant or dining as a category spend. I've read that many others carry other cards like CSP or PRG to capture that spending. But I believe in focusing on only one rewards and for me that is MR. I simply do not believe in diluting by spreading out too thin. The EDP has been the best card for my spending. It might not be for you and this is something you have to figure out yourself. So glad Amex introduced this card. Previously, the lowest AF card to earn MR was the Green Card with the same $95 annual fee. But you only earn 1X on everything. This card lets you earn 3X on groceries (cap at $6,000) and 2X on gas and 1X on everything else. But if you have 30 transactions a month, you get 50% bonus points. So that means 4.5X on groceries, 3X on gas and 1.5X on everything else. My only pet peeve with this is that there is no extra points for dining. Hence, I am keeping my CSP for that and travel. This is my first Amex card. I actually went to pre-approval page and was "pre-approved" for the Premier Rewards Gold, Amex Everyday Preferred and the Amex Platinum. After looking at the features, I think this is the card that would suit me best. You could consider me a suburban guy and gas and groceries is a bog part of the budget along with our mortgage. I am giving this a 4 star because it does not have restaurant and dining as part of the spending category. Otherwise this would be the perfect card. Right now, I using this card and the CSP for my spending. EDP for supermarket, gas and other non-category spending and CSP for dining and travel. Here is my expense breakdown. So glad Amex launched this card. I have had the green amex for years because I wanted to earn MR points but was not willing to pay for the higher AF charge cards like gold or platinum. The EDP has the same annual fee as the amex green and yet you can earn 3X at supermarkets, 2X on gas. And you can get 50% bonus points if you have 30 transactions a month. I have since canceled my amex green. Prior to getting card, I had the Amex Premier Gold, which was mainly used to earn MR points. However, I have since downgraded my card to the Everyday Preferred. I save $100 on the annual fee ($195 to $95) and still earn MR points. I hit the cap on groceries after about 9 1/2 months. So I ended up getting the Chase Freedom to "top up" since they do have 5% categories on groceries and gas. Since I put all of my expenses on the card, I never had any problems hitting the 30 transactions a month threshold and I have no problems getting the 50% bonus. For those of you who do not have an amex, all I can say is that customer service is top notch and their website and app are great as well. I used to have lots of annual fee cards like Amex Plat, Hyatt, Ritz. Platinum Delta Skymiles and a couple of others. I have since canceled all but only kept the Amex Plat, Chase Sapphire Preferred and this card. The Amex Plat I use to book airline tickets and I would use the Everyday Preferred for every things else. I will earn more MR points with the grocery and gas spending alone. Plus, I do use the card more than 30 times a month so hitting the 50% bonus is no problem. I think that for me, the Amex Plat and EDP combo allows me to earn the most MR points. I got the card because I wanted to earn MR points and see how it works for me. I considered Amex charge cards. All had annual fee. The closest comparison was the green card in that it also had a $95 annual fee. But with the green card, you only earn 1X. With this card, you earn 3X for groceries (up to $6000 a year) and 2X for gas and also get 50% bonus points if you have 30 transactions or more. That means for non-gas and grocery purchases, you can get 1.5X. The card has worked out well for me although I sometimes struggle to reach 30 transactions a month. So I am trying to maybe go the the supermarket more (it's an after work thing) and buy less each time. However, I kind of hate to change my habits just to earn more points. I may actually consider downgrading to the no annual fee version. The Amex EDP is one of the most under-rated cards around. It does not seem to get much mentions among bloggers. All everyone seems to talk about is the Chase Sapphire Reserve!! For $95 annual fee, you could potentially earn 4.5X on groceries and 3X on gas if you have 30 transactions a month on the card. I hit my $6000 grocery limit after 10 months. I use my Chase Freedom to cover the rest because they normally have one quarter where you get 5X for groceries. In fact, Chase Freedom normally has also another quarter where they give 5X for gas. Between these two cards, groceries and gas spending is covered as far as maximizing points/cash back goes. This is indeed one of the most underrated cards that hardly anyone talks about. The annual fee pays for itself. I do max out the groceries at $6000. Have three cars in the family and spend $6000 on a year. I also spend about $10000 on non-gas-grocery stuff. And I also meet the 30 transaction per month requirement easily. So that works out to 60000 MR points on just $22,000 a year of spending a year. This card works out perfectly for me because I want to earn MR points and being a family guy, grocery and gas spending is what matters to me. We do not eat out a lot so dining is not that important. I do not travel so getting the Amex Platinum does not make sense.